ePublishing Knowledge BaseePublishing Knowledge BaseePublishing Knowledge Base AdvancedHow do I send webmaster emails to multiple recipients? This article will show you how to access the email address that messages to the "webmaster" will be directed to and options for sending those messages to multiple recipients. 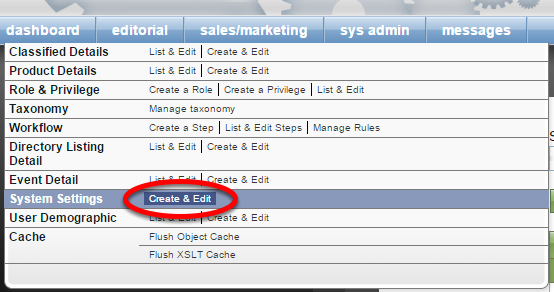 Access the webmaster email in your system settings under Sys Admin on your dashboard. Scroll to the file named "webmaster.email." Click Edit next to the file name. 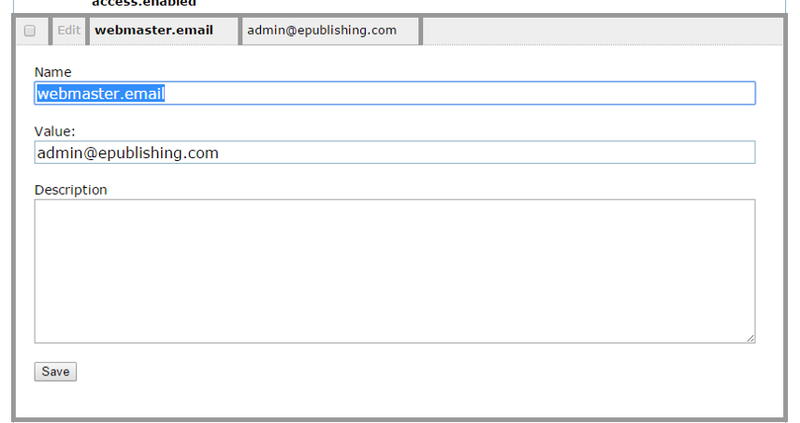 Update the Value with the email address you'd like to receive webmaster emails. Only one email address is allowed here. Zoom: Update the Value with the email address you'd like to receive webmaster emails. Only one email address is allowed here. If additional users need to receive emails sent to the webmaster email, ask your IT manager to set up your mail server so that multiple people receive email sent to the address you entered above. For form mailers or system settings that designate a "FROM" or "TO" address for transactional emails, only a single email address can be used. Again, you may set rules on your mail server that allow multiple people to receive emails set to those addresses. For example, if you set up a generic email address - info@yourdomain.com - you may designate on your mail server that emails sent to that address be delivered to two or more email addresses within your organization. This must be set up outside of ePublishing. Next: How do I update CSS styles on my website?